Upon casting, the property profile of most aluminum (Al) casting alloys can be modified by heat treatment in a targeted manner. This applies to both sand and gravity die casting alloys and also to some pressure die casting alloys (in particular ductile die casting alloys). However, parts produced by conventional pressure die casting (without the use of a vacuum) are subject to limitations regarding solution annealing due to the blister effect caused by excessive temperatures. In many cases, the potential of hardenable alloys is not fully utilized or parameters are defined unfavorably or even incorrectly due to a lack of knowledge regarding the diversity of heat treatment options (see Fig. 1 und Table 1). The selection of the type of heat treatment and its parameters must be based on the alloy type, the manufacturing process, the intended purpose and production-related boundary conditions. Generally, the application of heat treatment always involves an increase in costs and time needed. This article exemplifies methods for reducing both heat treatment costs and time requirements and gives an overview of how to optimize the heat treatment process and the resulting property profile in a targeted manner with a view to the intended use of a given casting. In comparison to wrought Al alloys, Al casting alloys for the production of castings are characterized by their high content of alloy elements, their prevailing high proportion of eutecticstructure and their good castability. What is essential for the behavior under mechanical stresses are the defects, in particular dislocations, present in the crystal lattice. 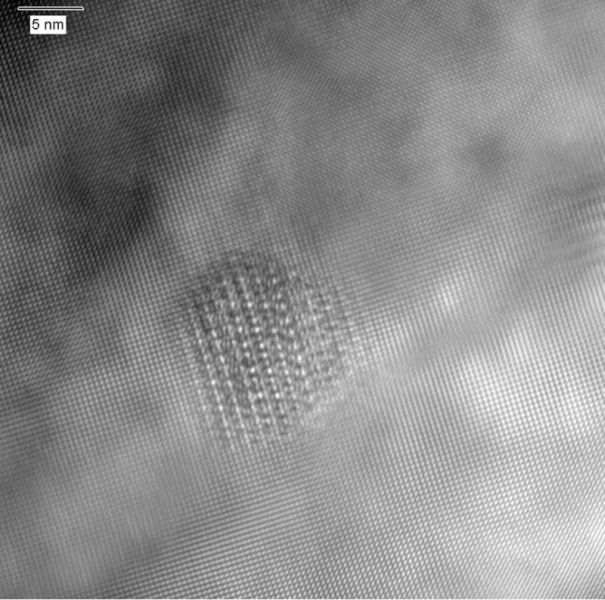 When subjected to mechanical stresses in the crystal lattice, these can easily move, unless they are impeded by other lattice defects. In order to increase strength, the hindering of dislocation movements is specifically utilized. However, particle strengthening or targeted precipitation hardening (also Hardening) can only be applied to those alloy systems which meet the required metallurgical requirements [1, 2, 3]. Hardenable aluminum casting alloys in particular include the alloy systems AlCu, AlCuMg, AlSiMg, AlMgSi, AlSiCu and AlZnMg. 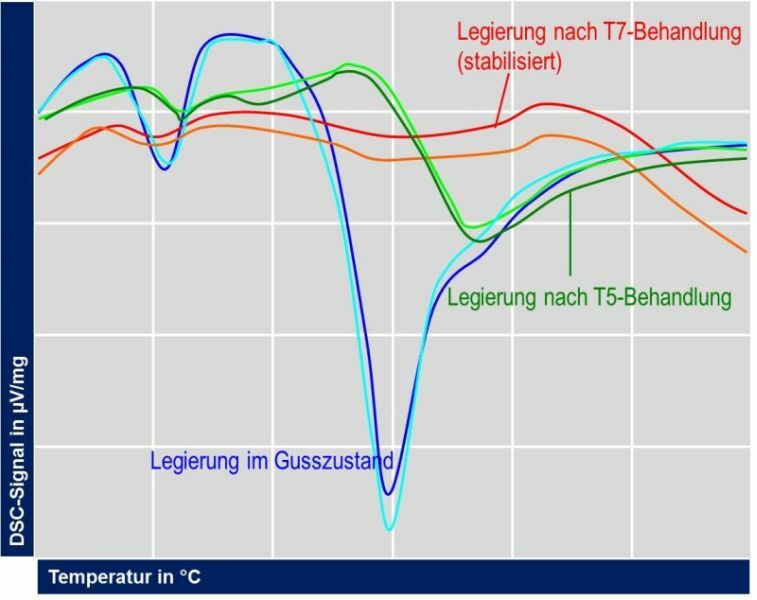 The classic T6 heat treatment, the normal version of a hardening process, comprises the steps of solution annealing – quenching – artificial aging, while special hardening methods can be used to obtain a particular property portfolio (Fig. 2). The prerequisite for the precipitation of particles in hardenable Al casting alloys is the presence of a highly supersaturated solid solution. This is mainly achieved by quickly quenching the casting after solution annealing which should be carried out at a temperature which is as high as possible. The solution annealing temperature and quenching rate or artificial aging temperature and time can be derived from time-temperature-transformation (TTT) diagrams (see Fig. 3). Unfortunately, literature provides TTT diagrams for only a few alloys , which are mainly only recorded isothermally and not continuously. If solution annealing is not possible for particular reasons (e.g. risk of blisters), the components must be quenched from casting heat as quickly as possible. This applies for pressure die castings and gravity die castings and is done to obtain a fraction of supersaturated solid solution that is as high as possible. During solution annealing of Al-Si-(Cu-Mg) alloys, eutectic silicon (Si) is also incorporated in a spheroidal pattern, resulting in lower notch stresses around the incorporated particles under external loads and therefore increased ductility. As the diffusion rate rises with increasing temperature, it is possible to reduce the solution annealing time for low or medium wall thicknesses (5 to 16mm) without causing strength losses. In order to optimize solution annealing time, the incorporation should be monitored over time and analyzed by means of metallographic and image analysis methods of component specimens (Fig. 4). Based on the results of Si incorporation in Fig. 4, the solution annealing time for a casting segment made of Al Si7Mg0.3 alloy could be reduced from 6 to 4 hours for a medium-sized foundry. This resulted in a 25% reduction in batch cycle times so that four instead of the previous three heat treatments were able to be carried out per day and furnace. When extrapolated for the year, this meant an additional throughput of 50,000 castings. In addition, approx. 550,000 kWh of electric energy can now be saved compared to the heat treatment used previously . 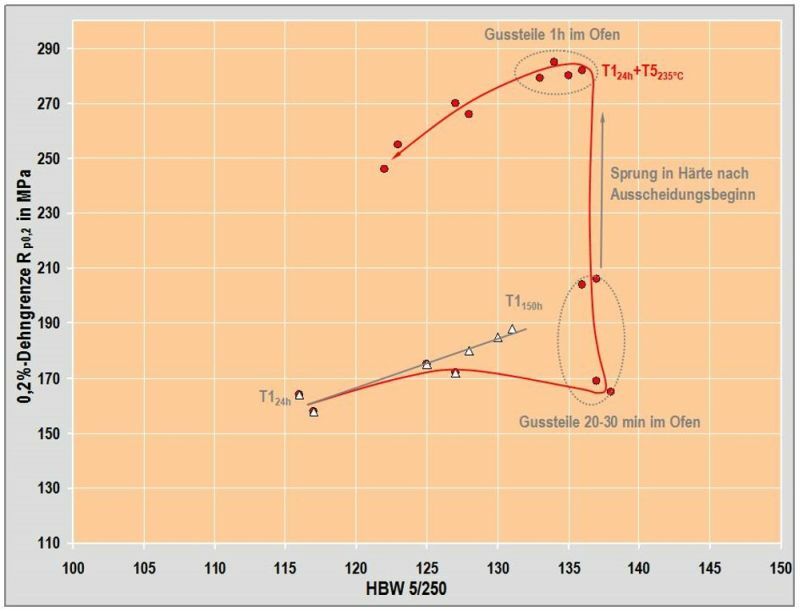 The hardeningpattern and the resulting characteristic strength curves for various artificial aging temperatures and times for the alloy Al Si7Mg0.3KT6 are shown in Fig. 5. Most artificial aging processes take very long from a production-related and economic point of view. When increasing the aging temperature, its duration can be reduced. However, it is important to take into account that the max. obtainable strength decreases since a portion of the alloy elements remain dissolved in the solid solution at higher temperatures and the precipitation sequences can change (Fig. 6). In this context, determining the mechanical properties by means of aged specimens is absolutely necessary. To components manufactured by pressure or gravity die casting and made of alloys of the type Al-Si-Cu (e.g. VDS 226: Al Si9Cu3(Fe) or VDS 225: Al Si6Cu4) belonging to the group of self-hardening alloys, solution annealing should and must not be applied due to gas porosity; artificial aging is, however, possible [6, 7]. As the alloys are present in a meta-stable state due to the rapid solidification, hardening is significantly accelerated by the input of thermal energy and higher values can be reached than with self-hardening (Fig. 7). The level of supersaturation mainly depends on the demolding temperature and the subsequent cooling rate. Therefore, the effect is better when the casting is immersed in cold water immediately after removal from the casting tool. For example, the aging of a die-cast Al Si9Cu3(Fe) at room temperature takes approx. 4 to 8 days. At a Rp0.2 of 210 MPa, artificial aging at 200°Cimmediately after casting results in higher strength values already being obtained after 1.5 hours. Measurements of thermal capacity (DSC) and analyses by means of high-resolution electron microscopy (HRTEM) are useful for determining and interpreting the precipitation sequence (Fig. 8, Fig. 9). This optimization can be used to obtain improved component properties. 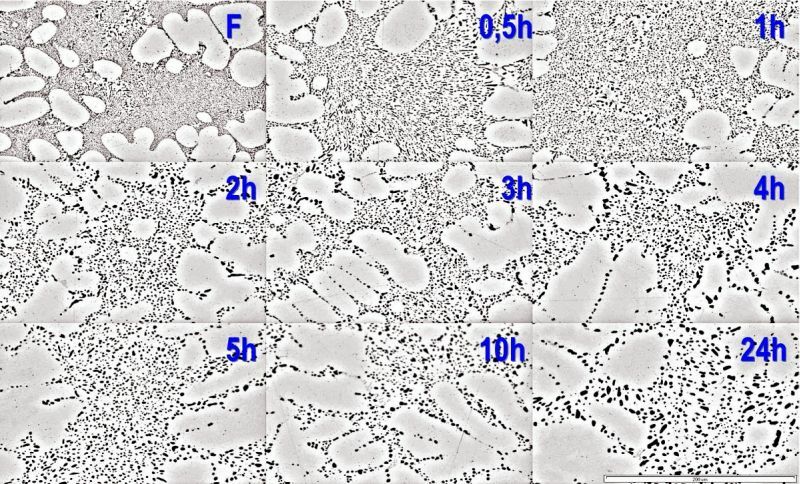 Some self-hardening alloys form rather finely dispersed, small, coherent precipitations at low temperatures and fewer but larger, incoherent particles at higher aging temperatures. A combination of both types of precipitation can produce optimum strength values in the casting . The yield strength curves as a function of subsequent artificial aging temperatures for die-cast specimens made of Al Si9Cu3(Fe) alloy and subjected to previous complete natural aging are shown in Fig. 10. This diagram is to be interpreted as follows: when pure natural aging is applied, the property field of the alloy Al Si9Cu3(Fe) is defined by the T1 field. Pure T5 treatment creates an additional property field, resulting in significantly higher strengths. 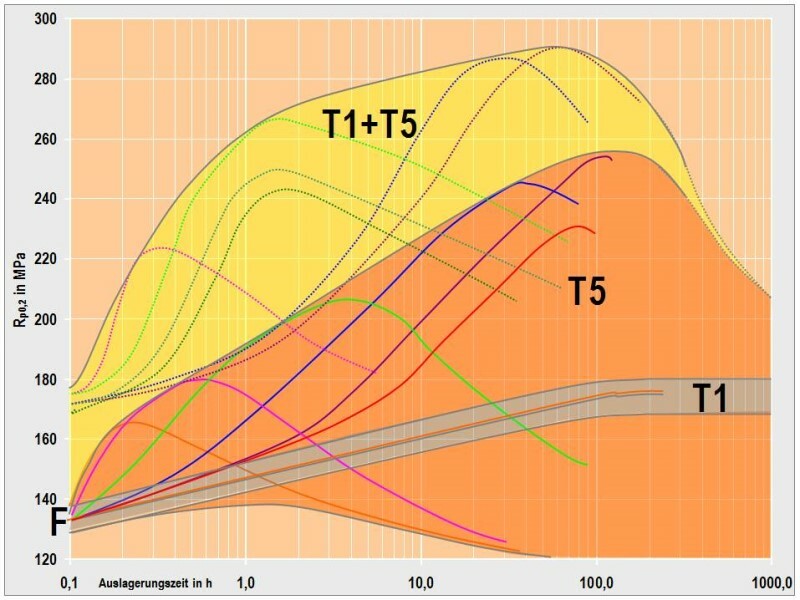 Targeted combination of T1 and T5 aging extends this strength range even considerably further, with the maxima at high temperatures (200 to 240°C) being able to be achieved with very short aging times (< 1h). The structure is thermally stabilized and dimensional variations or distortion no longer occur under the application temperatures present during subsequent operation; in addition, elongation is maintained at a higher level [9, 10]. Based on the results and the obtained high strength values, it was possible to design a crankcase with a lower wall thickness and achieve a reduction in weight by 10% compared to the original component. Thanks to the weight advantage and the more uniform strength properties, the costs of the component could be maintained despite short, yet additional heat treatment. The alloy Al Si12CuNiMg is a member of the group of artificially aged alloys which is why the standard EN 1706 does not provide any values for the as-cast condition but only for a T5 and T6 treatment. 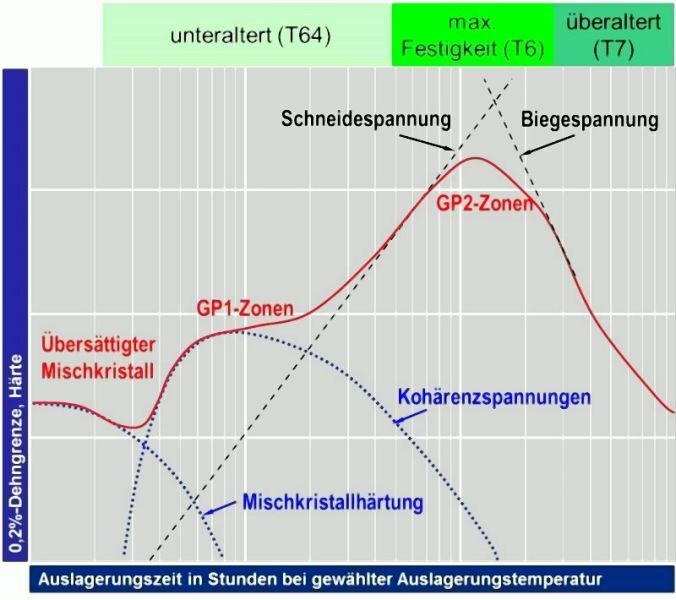 The solution annealing time of 5 to 10h at 525°C and the artificial aging times of 7 to 12h at 165 to 185°C indicated in literature are relatively long for practice application, therefore, the following discussion will focus on T5 aging and its optimization [11, 12]. Already since the mid 1960s, it has been known that intermediate storage at room temperature can sometimes result in a finer distribution of precipitates than with direct artificial aging immediately after casting [13, 14, 15]. This effect can be explained by the nucleation of precipitations at the GPI zones formed during intermediate storage. Thus, the distribution of precipitates upon artificial aging is the finer, the higher the density of GPI zones. However, these zones only grow as long as there are vacancy defects available. Premature annihilation of these vacancies can be prevented by adding elements such as copper and magnesium which exhibit strong interaction with vacancies. This results in the formation of a greater number of GPI zones above the critical nulceus radius . Fig. 11 shows the very finely (diameter of 5 to 10nm) and homogeneously distributed GPI zones created upon complete natural aging. This deliberately initiated, high precipitation density leads to an increase in strength which is mainly due to stress fields (coherency stresses) created by lattice distortions. Some alloy manufacturers recommend a shortened T5 heat treatment at 225°Cfor a duration of 3 hours. However, this variant is often not at all useful as overaging processes already begin to occur and there is a loss of surface hardness. In practice, the use of temperatures greater than 235°C is not eligible for process-related reasons as the strength maxima are reached very quickly and are passed. Due to the long response times of industrial furnaces and the sometimes varying times of manual activities such as charging and removal, reproducible mechanical properties cannot be obtained at temperatures of 250°C or more. A short delay in removal would already result in a dramatic decrease in strength and hardness values. The optimized heat treatment version is characterized by a rapid and immediate increase in hardness occurring after an artificial aging period of approx. 45 min at 235°C, with the subsequent decrease in hardness being rather moderate. The pattern of artificial aging is illustrated as a Rp0.2-hardness diagram in Fig. 12. However, series castings need to be removed from the furnace relatively precisely one hour after insertion. This time already includes heat-up and through-heating of the castings. This results in the combination of a Rp0.2 of more than 280 MPa with a hardness of HB 135. Compared to the recommended times for T5 heat treatment, it was possible to achieve a considerable reduction in time and costs, with the minimum values indicated by the standard EN 1706 for the surface hardness, 0.2% yield strength and tensile strength of AC-48000 significantly exceeded. 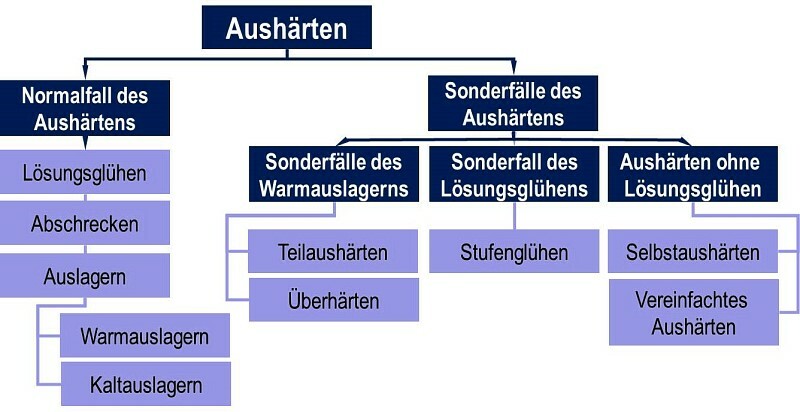 2 Geier G., Rockenschaub H., Pabel T., Variation of the precipitation mechanisms for high pressure die casting alloy Al Si9Cu3(Fe), Gießereiforschung 58 (2006), no. 3, p. 2-18. 3 Aluminium-Taschenbuch, Band 2, Aluminium Verlag, Düsseldorf 1999, 15th edition. 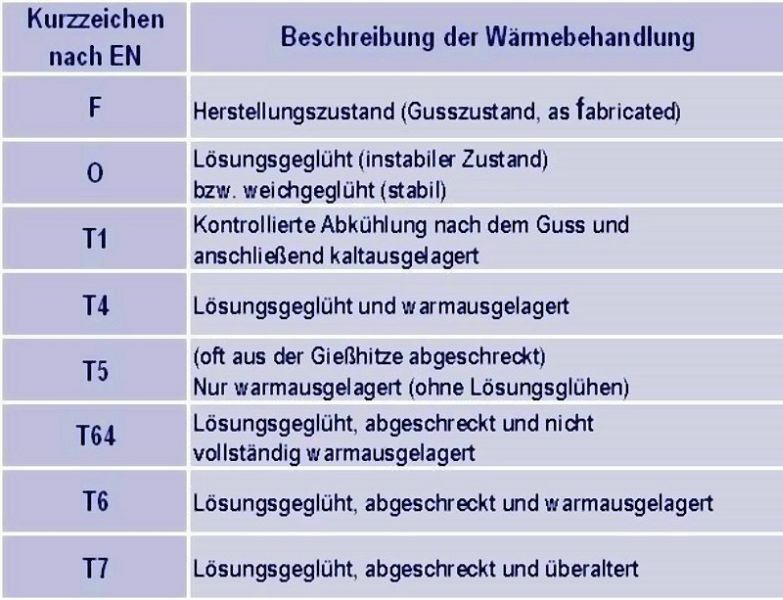 4 Zschech E., Metallkundliche Prozesse bei der Wärmebehandlung aushärtbarer Aluminiumlegierungen, Härterei-Technische Mitteilungen 51 (1996), no. 3, p. 137-144. 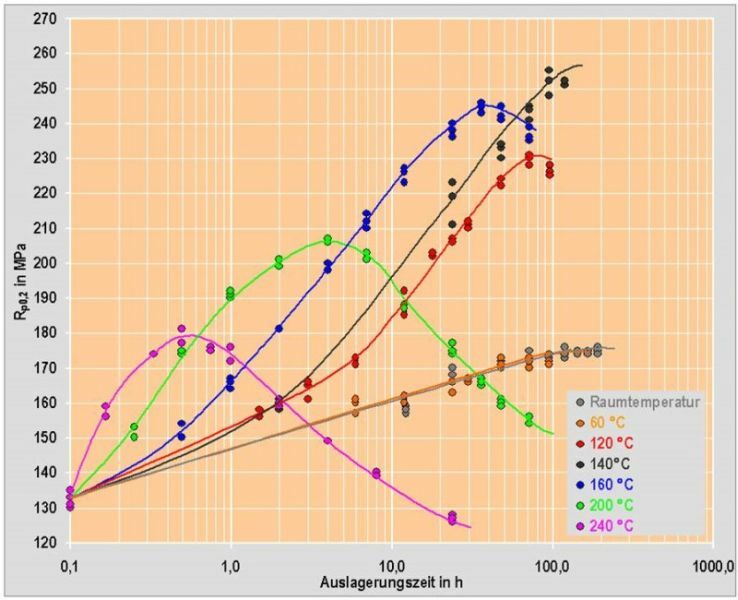 5 Dambauer G. et al., Optimierung der Wärmebehandlungsparameter der Legierung EN AC-Al Si7Mg0,x, Gießerei-Rundschau 53 (2006), no. 3/4, p. 50-56. 6 Rockenschaub H. et al., Beschleunigung der Auslagerungsvorgänge der Druckgusslegierung Al Si9Cu3(Fe) bei gleichzeitiger Erhöhung der mechanischen Eigenschaften – Teil 1, Druckguss-Praxis, 3/2005, p. 95-104. 7 Rockenschaub H. et al., Beschleunigung der Auslagerungsvorgänge der Druckgusslegierung Al Si9Cu3(Fe) – Teil 2, Druckguss-Praxis, 4/2005, p. 137-146. 8 Kelly A. et al., Precipitation Hardening, Progress in Materials Science, Vol. 10, no. 3, Pergamon Press, 1963. 9 Pabel T., Rockenschaub H., Geier G., Improved mechanical properties of the high pressure die casting alloy Al Si9Cu3(Fe), International Journal of Materials Research, 98 (2007), no. 6, p. 216-220. 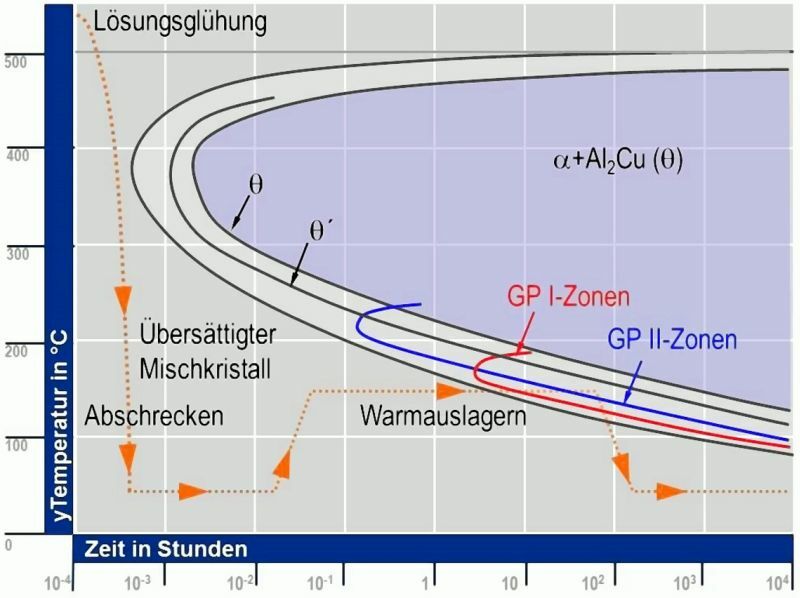 10 Rockenschaub H. et al., Neue Wärmebehandlung für beste mechanische Eigenschaften im Aluminium-Druckguss, Giesserei 93 (2006) no. 7, p. 20-33. 11 Rockenschaub H. et al., Charakterisierung der Kolbengusslegierung AlSi12CuNiMg - Teil 1, Gießerei-Praxis 2008, no. 1-2, p. 13-25. 12 Rockenschaub H. et al., Charakterisierung der Kolbengusslegierung AlSi12CuNiMg - Teil 2, Gießerei-Praxis 2008, no. 3, p. 68-78. 13 Holl H. A., Journal of the Institute of Metals 93 (1965), p. 364 et seq. 14 Lorimer G.W. et al., Acta Metallurgica 14 (1966), p. 1009 et seq. 15 Pashley D.W. et al., Philosophic Magazine 16 (1967), p. 51 et seq. 16 Guo Z., Sha W., Quantification of precipitate fraction in Al-Si-Cu alloys, Materials Science Engineering A 392 (2005), p. 449-452.